July | 2007 | takilya ni leaflens - dakilang #filmmiron ever! during one of my sleepless bouts with sickness, i caught this stupid film produced by mtv films on hbo. punyeta nakakainis. lahat sadyang nang-iinis — yung storya ng isang parang simple minded pero may caustic wit na eengot-engot na loser bida na may equally nakakainis na kamag-anak, tapos static ang shots na okay alam ko sinusubukang ma-achieve ang isang comedic style pero it doesn’t deliver. nagaganap lahat ito sa isang typical americanan small town. bata punyeta nakakainis siya panoorin. walang nangyayari at walang kuwenta. so bakit ko pinanood? i still keep the thing i learned from carlitos siguion reyna years back when he said in our class na we also have to watch bad movies because we learn a lot from them, too. at tama siya doon. i wanted to see what kind of ending and story this kind of film will have. lesson learned: may reason kung bakit 2:30am ito sumasalang, so don’t trust films that run at that time that much. evolve or die? well, whatever. yun ang tagline sa poster. maganda naman yung film. as expected, it was really dark but this time, the dark played well with the story unfolding on the big screen. i don’t think this film will be appreciated if you see it on video in the small screen, kahit pa malaking plasma tv ang tv mo sa bahay. you should see this on the really larger than life silver screen. especially the flight scenes of the markus kalaban character nung lumilipad-lipad siya at binubunggo-bunggo nya ang truck na minamaneho ni selene our heroine (tama ba spelling?). the film really took off where it left off before, literally, as in talagang continuation of the previous film. maganda pa ring panoorin kasi hindi ma-a-alienate ang mga di nakapanood ng dating film. the flashbacks and back stories were craetively unfolded and told in this narrative sequel. they were inserted in the form of memory flashbacks, crafted creatively as “memory maps in the veins of the vampire.” kumbaga, their blood is the book of maps from where they can trace past events. ang ganda ng detail na iyon. unique. and then of course, there are the uv rounds pa rin or the bullets used to kill vampires are composed of ultraviolet light (blue colored) which simulated daylight. galeng no? i really liked that bit even during the first film. creative. feeling ko lang, though, masyadong marami ang cgis ng mga creatures creatures ek this time. 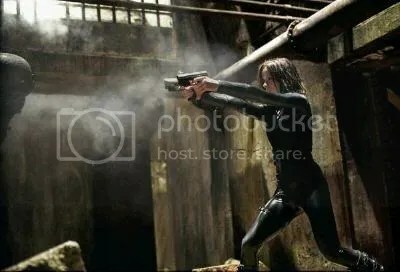 kung hindi lang siya nabalanse ng husto sa revelation ng mga snippets of kwento, magsasawa ka agad kasi parang obvious na type nilang gawing fx-film lang ito at i-sacrifice ng konti ang kwento, just like what happened to MATRIX 2. very forgettable and regrettable. one line of dialogue in this film that i like is when the ancestor of the antagonist was talking with our protagonist. sabi ni girlash “what will i become” or “what will become of me?” at sabi ng kalaban niya “the future.” that was such a simple dialogue exchange but it was so powerful. and profound. i like it because it is that: simply profound. and in that essence, maganda nga ang mga dialogues ng characters dito; halata mo kung saang siglo sila talaga galing. ang galing. that’s what i like about vampir films pati; slight poetic magsalita kasi ang mga vampire hehe. i like. 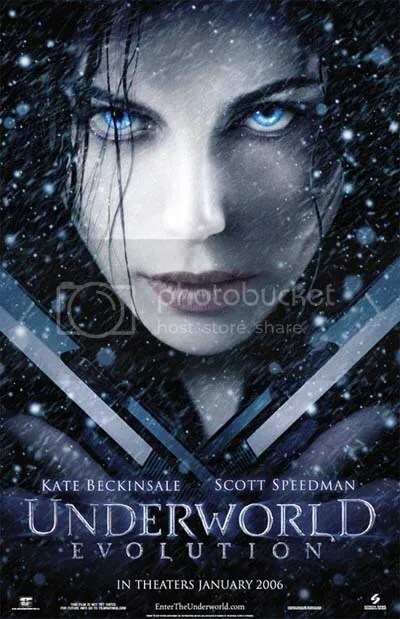 UNDERWORLD EVOLUTION is exciting. panoorin niyo. the film is a good one. and lest i tell you some spoilers, i can’t really do a tell-all of this film. basta from my point of view, everything was great and worked well — the acting (or the non-acting, like polo ravales still enrolled in the wooden school of acting but again, like in ROOMBOY, it worked well here. also super derma-faced christopher de leon’s usual trademarks which are getting tiresome kung ang ka-sparring acting niya ay walang kalatoy-latoy. pero buti naman and that dennis guy who portrayed his son can hold his own, as well as the other veteran syempre esp eddie garcia and ms boots anson roa. ), the script (except sometimes na meron sanang pataas na red flags of slip-ups pero pa-raise pa lang naman, hindi naman tuluyan kaya keri pa rin ang suspension of disbelief somewhat), the cinematography (i’m a sucker for sepia/amber-toned lighting design, and it worked well to give the flashback scenes a texture of ‘feeling old like an almost faded photograph of a bucolic scene’ also good work on lighting night scenes NOT using blue tones — dahil ang moonlight ay hindi color blue, unlike what old dops insist before! however, i’ve a thing to say about winter-blue cold lighting texture when doing scenes supposedly in America. hindi naman laging ganun ang tone ng atmosphere doon. unless during winter siguro.) and the production design. there were also some cgi work done here, if i saw it right, notably in the ww2 dogfight scenes. that was a good effort kahit hindi gaanong believable na fighter pilot si mark kilay herras ba yun? si polo pa believable. i just noticed that in our local films, sometimes the one thing that they neglect is the accuracy in the language, notably in the accents. like i don’t think a 1945 filipina would say “thank you” in a 2005 very americanized tone, unless nanggaling na siya sa US or may training/exposure na ganoon. and the way they should speak tagalog, dapat hindi parang contemporary tagalog. iba ang accents noon. for research, period film actors should be made to watch actual films filmed during the old times. hindi ba sila nanonood ng mga sampaguita lvn classics noon? they use words lke “siya nga?” instead of “talaga?” or “siyang tunay” instead of “tama!” or “minarapat kong pumarito” etc. it was more poetic back then. saka less ang conjugations hindi tulad ngayon. like yan, the don’t use “di” but they say “hindi” most times or “doon” instead of “dun.” just watch the films na lang kaya ni gloria romero noon, nina paraluman, you’ll get that language nuance. importante kasi yan e, at least for me ha. sa hollywood, there is such a job as dialect/dialogue coach na ito ang tinatrabaho, especially pag crucial ang language sa storya. dibala ang galing lang ni kate winslet, russell crowe at nicole kidman mag-american english kahit medyo halata pa rin ang aussie accent nila pag interviews? well, okay lang yun. medyo dedma na rin. basta in totality, maganda ang film. uber-romantic nga lang siya pero romance disguised like a mystery thriller kasi kaya parang okay ang twists. mystery thriller kasi may quest/journey storyline yung characters at ma tinatahak silang misteryo, na maku-curious ka rin kung ano ang resolution in the end. another impressive thing about the film is the way it handled the male lead characters. it’s so very filipino at okay siya, very realistic and natural. good character build-ups. kaya matibay ang tayo. saka the way they all interacted, magaling din yung delivery ng ensemble nila. it’s romantic but not sappy mushy dahil nga siguro parang typical pinoy middle class males ang bida. the demographics worked well for the story it was trying to tell. ah basta, panoorin niyo na lang. worth it siyang panoorin sa magandang sinehang mataas ang bayad hehe. 🙂 pero beware of the overkill of the song, of course. e ako biased, i like those types of songs from that era (“blue moon”) kaya tolerable for me. ito dapat ang na-rated A ng CEB. na-rate kaya? instead of that ILUSYON film last year sus puwede be. it has been a habit of mine to watch something — a dvd film or an episode of a tv series i am currently engaged in — while eating. yes, i am not quite buddhist in practice when it comes to eating especially eating alone, and my eyes and ears yearn for the fix of something to do while my stomach and tongue feast on something on their own. so on new year’s eve, i watched this film adaptation of a book i’ve always seen in powerbooks but has never caught my fancy enough to buy it — PROZAC NATION. the film stars one of our favorite no-nonsense white american thespians, christina ricci. she also shares some producing credit of some sort. it’s directed by a norwegian guy and also stars jessica lange whom i haven’t forgiven to this day for snatching the 1994 best actress trophy for BLUE SKY from my beloved jodie foster’s NELL. argh. heniwey, on to the thang. i browsed through reviews of the book and it’s gotten quite the raves here and there. it is an international bestseller which prompted my curiosity when i saw the film version. the author, american elizabeth wurtzel, has been compared at one time to one of our favorite clinically depressed authors of all time (yes, i have a list of that, msg me if you wanna know), sylvia plath. well, i can’t tell if PROZAC NATION can approximate THE BELL JAR but methinks i have to read wurtzel’s book soon in order to understand how it actually captured the complexities of clinical depression. and why do i have to read the book? after watching the film, i am wondering how this film captured the complexities of the book. maybe it did not quite make it. given the amount of time a film has to unravel a plot, it is understood how things can be left out or characters get composited (just like what happened to some characters in isabel allende’s novel’s HOUSE OF THE SPIRITS film adaptation before and with carl sagan’s CONTACT din). truly, i believe something is amiss here. i believe the writers and the director didn’t do much in understanding the state of mind of someone who is clinically depressed. case in point again: the dop referred the protagonist’s detached stance in life as being “narcissistic” for goodness’ sake. hello. well, the pressure of cross-genre textual translation is always daunting, i guess, but this shouldn’t be an excuse. it wasn’t for peter jackson when he took on tolkien, remember that. at tatlong pelikulibro pa yun. so there. perhaps ricci could have hooked up with someone who is more familiar with the subject matter or a woman director instead (i theorize that women instinctively know about depression, being born of a gender with a history of thousands of years of depressing states). maybe the film could have fared better. or better, if wurtzel also had a hand in co-writing it just like hubert selby did with REQUIEM FOR A DREAM.